← Get Your $15 Million Here! No one likes a trip to the dentist. But if you lived in the 1700s, you would have liked it a lot less. 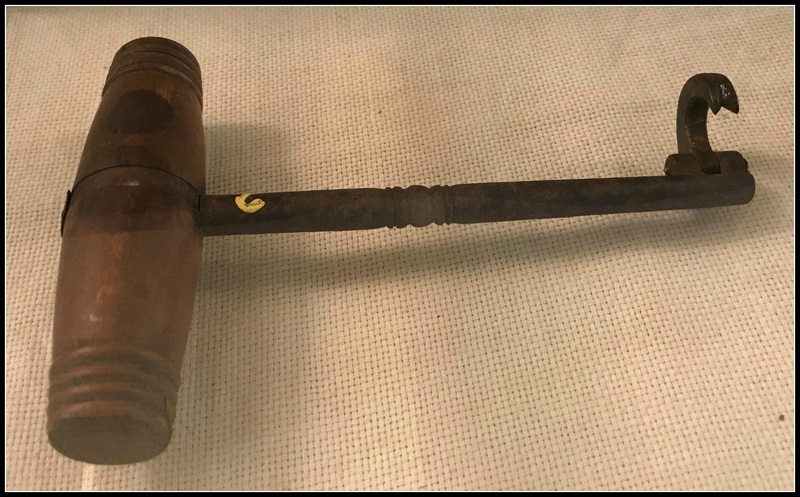 The Westport Historical Society‘s most recent Mystery Object was a tooth key. Modeled after a door key, the tooth key was inserted horizontally into the mouth. Its claw tightened over a tooth. The dentist then rotated it, loosening the tooth. The original design featured a straight shaft, which caused it to exert pressure on the tooth next to the one being extracted. A newer (1765) version featured a slightly bent shaft. The photo above shows the earlier design. It was donated to the WHS by Mrs. William L. Coley. The tooth key was part of the ongoing “Westport in 100 Objects” exhibit. Every 2 weeks there’s a new mystery object. If you stop in and identify it, you can win something from the gift shop. There was no winner this time. Which may be good. It means no one in Westport has had actual experience with a tooth key. This entry was posted in Looking back, Organizations and tagged tooth key, Westport Historical Society. Bookmark the permalink. It would be great to have a ruler in the photo to see the relative size of this tool. I am so pleased to announce that although I am considered a senior citizen I do not go that far back. Did anyone survive the use if this tool? Thanks for sharing these mystery objects. They are an education all by themselves. Love this feature, WHS. Everyone can relate to the personal perils of dentistry. Nothing like cool artifacts to make history come alive and, in this case, give real context to something we all dread. Keep up the great work! Well, that’s one way to do it, hahaha! Or, try the CastAway method … “ found” ice skating blade in FedEx box for a mirror … views face … see tooth … holds rock … aim … aim … aim … and, hit!!!! Blam, out cold, and just missing the fire pit in the cave. When I was a kid, we used to tie a string around the tooth, tie the other end to the doorknob of an open door, and slam the door shut. Actually, that was for baby teeth, but it worked! Alas, I missed my chance! As a training dentist my studies did include the historical aspects of instrumentation. Now retired, I can reflect on the pleasant image change we dentists enjoyed due to many factors .But in great part the improvement of tools and mastery of anesthetic techniques have made dentistry not so scary.